Some seriously homesick Bombayites created this Indian restaurant in Covent Garden Indian. 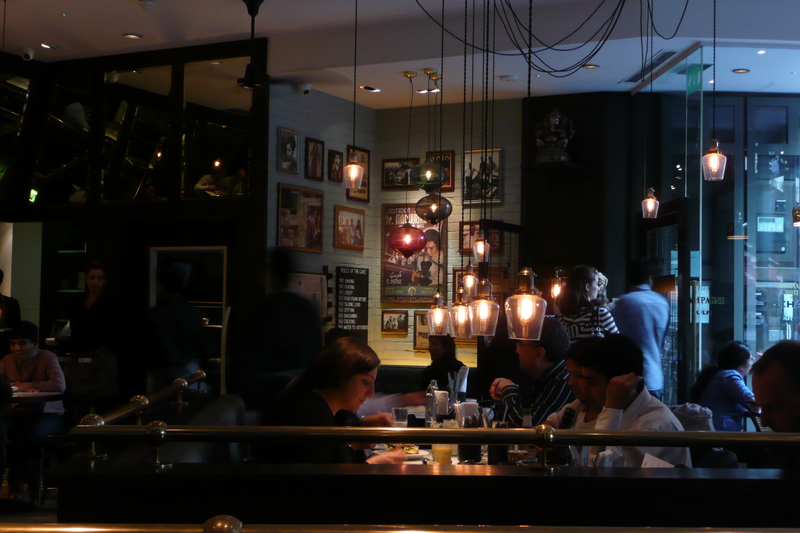 Dishoom draws heavily on traditional Bombay cafes to recreate a little piece of old Bombay in London. Slow-moving wooden fans whir lazily on the ceiling above intimate booths. Large, highly shone mirrors cover most of the walls. Downstairs, bits and pieces of nostalgic Indian products like soap, tiger balm and hair oil fill cabinets in the gorgeously retro bathrooms and Art Deco mirrors surround the heavy ceramic sinks. Best of all, chai is served in tall, slim glasses – a simple touch so effective that it immediately took me right back to my trip to India, hailing chai-wallahs as they wailed their trade up and down streets and trains. The food is a successful fusion of English and Indian – think bacon naan rolls for breakfast. We went for dinner and ate murgh malai (five pieces of mildly marinated chicken thigh), sheekh kabab (way too spicy for me), grilled masala prawns (five fat, succulent prawns cooked in lime, tomato and coriander), riata (a generous portion) and naan ( a little too crispy for me). For dessert I had the creme caramel, but food envy struck as I watched my companions drool into their chocolate fondant and cinnamon ice cream. But the drinks stole that Bollywood limelight. Chai, mango and fennel lassi and fresh mint tea. I can’t wait to go back to while away an afternoon with a glass or three of chai, one of their free copies of the Times of India and these brilliantly funny videos on the Dishoom blog. Of course, no matter how hard it tries, Dishoom can’t be an authentic Bombay cafe. You can’t imitate the characterful faded elegance of Bombay’s original cafe’s. There are no Dyson Airblades to dry the hands of customers there. And I’d certainly never order a tap water in Bombay.